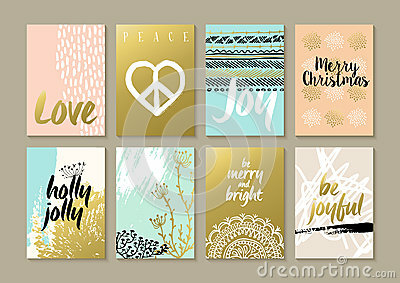 Merry Christmas retro hipster boho card template set with vintage hippie style elements and trendy holiday text quotes in gold metallic color. Ideal for xmas greetings. EPS10 vector. New year and Christmas wreath. Vector Roller Skates on Christmas checkered seamless pattern background.